The Middle Kingdom began with the 11th dynasty, when Mentuhotep Nebhepetre II reunited upper and lower Egypt. The great monument of this time was Mentuhotep's mortuary complex. It was built against the mountains of Thebes, the capital of the time. Mentuhotep's mortuary was centered on a terraced temple with pillared porticoes. Mentuhotep ruled for 51 years. During this time he made Egypt a very strong country again but do to some family problems their dynasty fell and a new dynasty began. The 12th Dynasty started with Amenemhet I's rule. 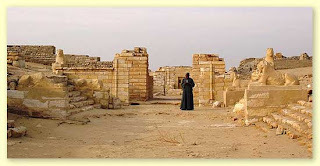 Amenemhet moved the capital from Thebes to a new city called Itj-tawi. The Climax of the 12th Dynasty was when Sesostris III brought political, economical and cultural climax to the Country. The Middle Kingdom was the first Kingdom after a very destructive Intermediate Period. It was a very accomplished Kingdom and many things were improved during this time. After the Middle Kingdom came the Second Intermediate Period. Lassieur, Allison. The Ancient Egyptians. San Diego, Ca: Lucent Books, 2001. Romer, John. People of the Nile. New York: Crown Publishers, 1982.